Now in stock for immediate shipping. 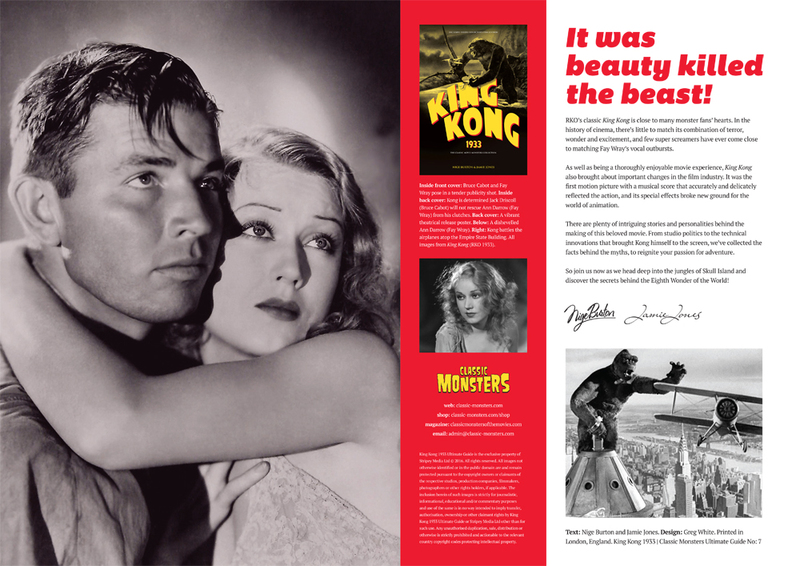 The King Kong Ultimate Guide evokes the brochure you might have bought at the cinema in 1933! 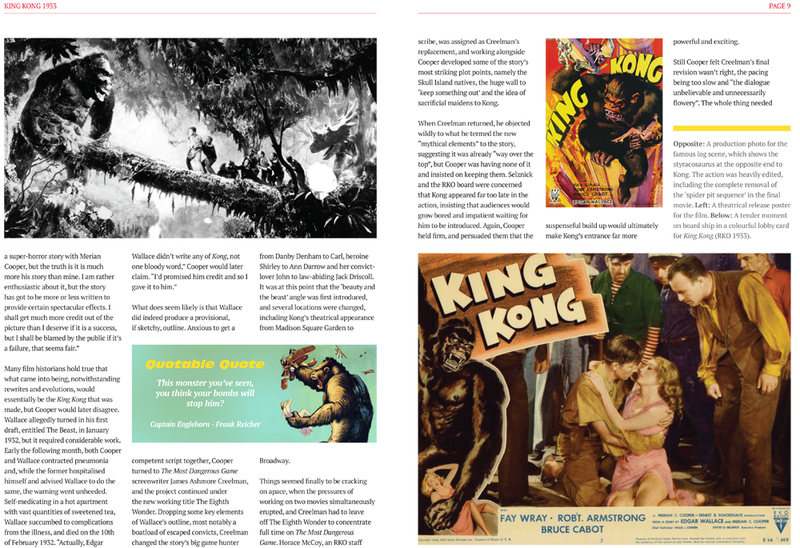 Head back to Skull Island with our luxury magazine guide to RKO’s legendary King Kong. Even after all these years, it’s the cinematic adventure romp of a lifetime, showcasing Willis O’Brien’s extraordinary stop-frame animation talents which are still loved by many, more so than modern takes with CGI. 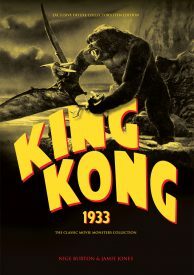 The acting talents of Robert Armstrong, Bruce Cabot and even the incomparable Fay Wray are no match for the Eighth Wonder of the World himself, Kong! We lovingly present our deluxe shrine to this behemoth of a monster movie. Our King Kong magazine guide takes you right to the heart of the action, and has been studiously written and compiled by your usual Ultimate Guide authors, Nige Burton and Jamie Jones. The pair have raided the archive to bring you many rare and often unseen stills and posters which capture the very essence of Merian C Cooper’s sensational masterpiece, and each one is reproduced faithfully to the unbeatable high standard you’re used to. 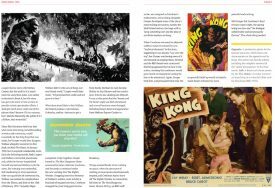 Within the pages of this King Kong magazine you’ll find in-depth articles telling the story of the making of King Kong, its impact on cinemagoers on the time and its lasting legacy and influence on pop culture. There are also detailed biographies of the cast and crew, and a cheeky look at Kong merchandise through the ages. We also look at sequel The Son of Kong (1933). My KING KONG issue arrived yesterday, great magazine. Thanks for the glorious King Kong book. It arrived today. 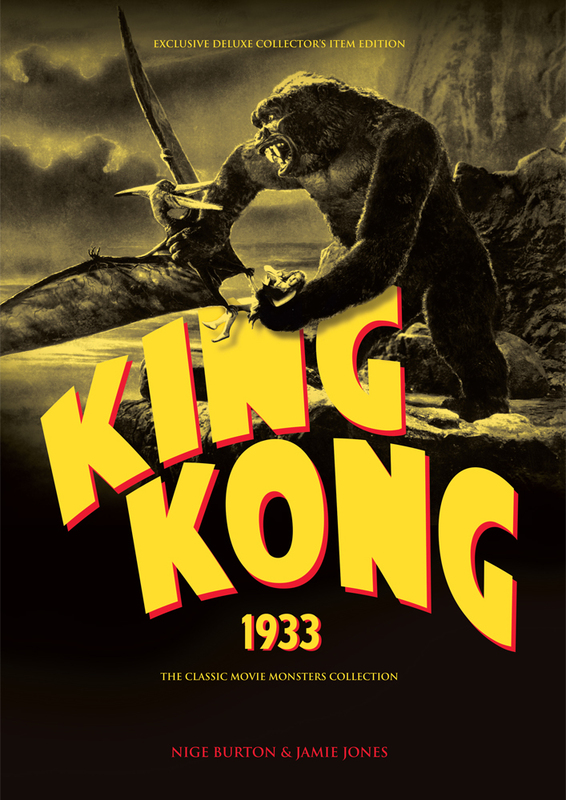 Today I received my copy of King Kong 1933!! I love it! It has information and pictures that I had never known before! 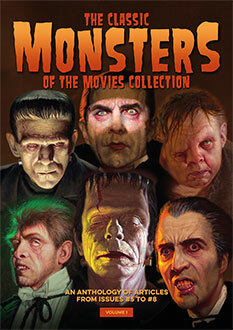 As a charter member of “Famous Monsters of Filmland” I have no doubt that ‘Uncle Forry” would love this Collection of magazines as much as I do. My best compliments go to Nige Burton and Jamie Jones. Perhaps one day, we will meet!! Just finished reading. I have been a classic horror fan since age 12 (now 65) and there were a few photos and bits of info that were new to me! 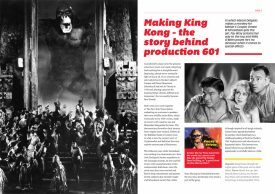 Trust me, I’ve seen Kong dozens of times and this is the best overview since Famous Monsters Kong special issue way back in the early 1960,. Keep it up! This is my favourite film of all time, so I was very happy when I received this as a Christmas present. Love it! Absolutely knockout. This is the best magazine that I have ever seen dealing with the original King Kong film. The cover is stunning. The perfectly reproduced posters on the back are worth framing, but it would be a crime to ruin this beautiful publications. Very sharp superb publications. The word “magazine” doesn’t really do these publications justice. They are very high quality full colour and beautifully illustrated throughout with rare stills, photographs, posters and artwork relating to each film. They are expertly written with all the required information and synopsis. I made the mistake of buying the “Creature from the Black Lagoon” edition and then realised that I would then have to collect them all, I was hooked. I’ve been collecting monster/horror film magazines for over 20 years, I have a vast collection and these are right at the top of the best produced publications that I have ever seen. Thick glossy covers. The contents have professional reproductions throughout. I am very impressed indeed. New editions seem to pop up monthly and I must have them all. Brilliant.